Are you aware that if you decide to go on a trip with your friends or family members, you should definitely consider including the best solar radio you can get your hands on, in your survival kit? Did you know that this important tool can help you provide the group some additional enjoyment as well as help you stay informed about the news in the world? 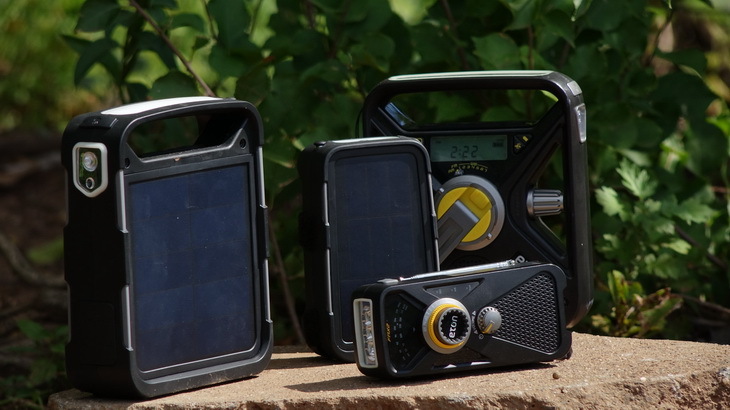 Yes, the solar radios are a good choice, especially because they are using the energy from the sun and using it to power their own systems. 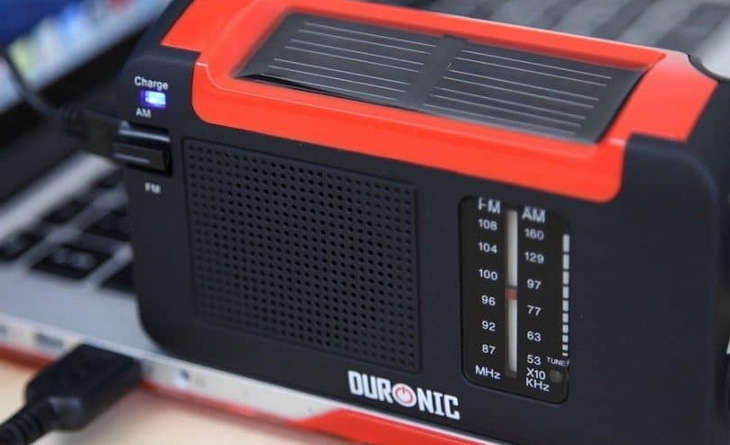 These types of radios have a specific feature, such as off the grid capability that puts them on the list of emergency products. You could also use them for camping, hiking or other outdoor activities. However, it’s important to know which features to look for depending on your trip. In this article we came up with a list of the solar radios we consider the more convenient. Not only that, but we also look in more depth into the features you must consider before buying any of these items, and we explain the to you so that you can make a better choice. We make a list of the specific features you should consider when deciding for a portable solar radio. When you buy a solar radio, the first thing you should look for is the way of powering. You have to keep in mind that these systems must have another source of powering such as adapters or USB chargers. If the weather is rainy, cloudy or dark, it would be convenient to have another charging source. Think about buying batteries just in case your USB adapter doesn’t function. Obviously, you must have two or three powering options if you want to use your radio. Of course it is always better to have more charging options. This is an important characteristic for every product. You don’t have to buy radios over and over when you plan to travel. Most of the solar radio systems have a plastic shell, which is thick, and it is placed on the outside, in order to protect the inner electronics. It has to be made of a thick plastic material so that any damage to the device while it is in use can be avoided. You also have to protect the hand crank, because it is not something that should be broken if you plan on using it for a long time. Protect it from dropping it on the floor, or from heavy usage. 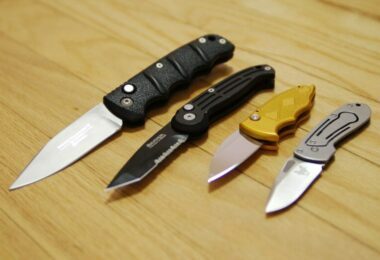 Choose the right one for you, while also considering its durability. This is likewise a very important characteristic that you shouldn’t take for granted. Especially, if you plan a hiking trip or backpacking where you need many things, and the weight of your gear will not be that light. The radio should be light, without hampering your way of movement. When you are in the store buying a new one, we advise you to hold it in your hand for a few minutes. This way you would notice if it is as easy as on the first look. Wearing your solar radio doesn’t have to turn out into a nightmare if it is too heavy. It could be attached to your belt or you could hold it in your hands. Some of the products come with additional attaching tools for a sack or a jacket. It is good to know that the radio you bought, is waterproof. You will never know when the weather could change from sunny to rainstorm. The weather forecast is not always true for the upcoming days. If your radio has stopped working because of the weather, you won’t be able to get useful information. But, it is recommended that the device should be waterproof regardless of the weather conditions, because, for some reason, you could spill water on it, and make it useless. That is why you have to give this feature an advantage when buying a new solar radio. When you are stuck in the middle of nowhere and don’t know how to turn on your solar radio, it is a complete waste of time to just to sit down and read all the instructions. Because of this fact, consider that it should be easy to use and that the display should be easily readable. Ask for a help in the shop always, especially when they claim that the product has some unique features, and get more familiar with the product before you buy it. We came up with a list of the best-reviewed radios on the market. Now it’s up to you to decide which one you prefer based on your needs and the features that they offer. 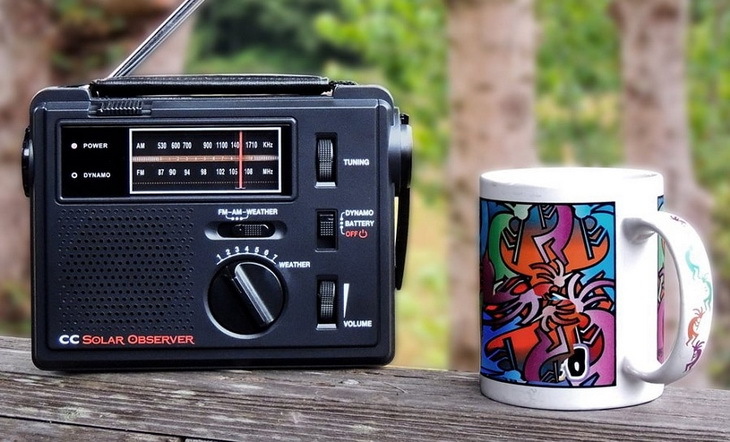 They are all great radios, but again, the choice is up to you. 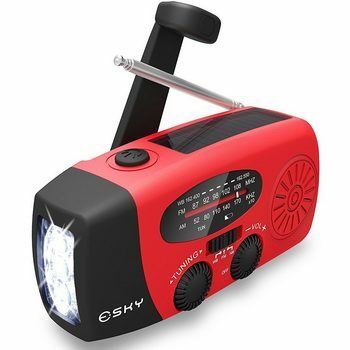 Specific features: High-quality generator, 5-way powered, emergency AM/FM/SW NOAA weather alert, solar, dynamo crank, flashlight and reading lamp. Description: The Kaito KA500 Solar Radio is a great product for your outdoor activities. It is a must have device in an inconvenient weather situation like earthquakes or other disaster. It has many features that are good for this type of situation. The Kaito’s product has a high-quality generator. 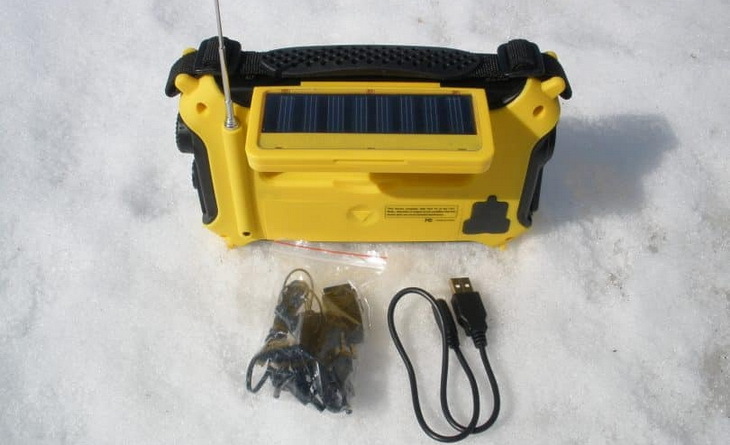 As it is a solar radio, it contains a solar panel that charges the device by itself. The solar panel is incorporated and it has the ability to tilt and to coordinate with the position of the sun. Another good characteristic is that the batteries could power it too, so you don’t have to worry as much about the charge. The product comes in five colors black, blue, green, red, and yellow. Consider that the best color is that one that is easily noticeable in the nature. This is especially important because you could forget the radio and miss the opportunity to use it again. Related: The Kaito AD500 Adapter is the ideal adaptor for the radio, so that you can charge it before going on an adventure during the days when the sun is behind the clouds or for the nights. 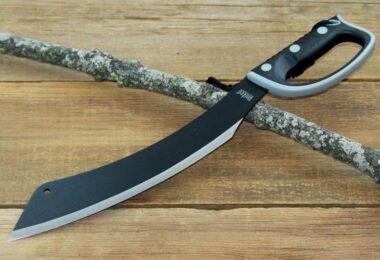 Best use: Ideal for traveling, emergency and preparedness situations and also for outdoor activities. Description: The Esky ES-CR01 Emergency Radio is an amazing product that is worth to be in your emergency kit. It is up to date with all the information about the weather condition and it is also in touch with the NOAA weather. You could easily listen to your AM/FM station that you adore. The device contains a super bright flashlight that keeps you safe during the night. The LED light is 3W and it has 140 Lumen. When the battery is low and it is dark outside, you could easily recharge it with the USB charger. It is good when you know that you have more powering alternatives. One of the rechargeable ways is the solar panel that is in direct contact with the sun. It allows you to power the radio after the exhausting usage. The hand crank is also a way of charging and it winds up the internal alternator. As mentioned above, the third way of powering is through a USB port and the 1000 mAh Power Bank that comes in the package. It is a small size radio system that possesses clear and loud speaker. It has a pocket size and we think that this is the right one that you are looking for. Related: If you’re using the radio for emergency situations in trips, the Kangaroo KM-10004-187 Blankets are a good combination, as they will provide protection in numerous weather conditions. 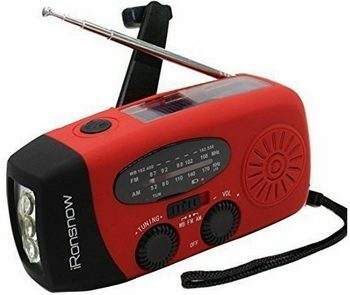 Description: The Ambient Weather WR-111B Solar Hand Crank is a great product because it looks like the everyday radio. 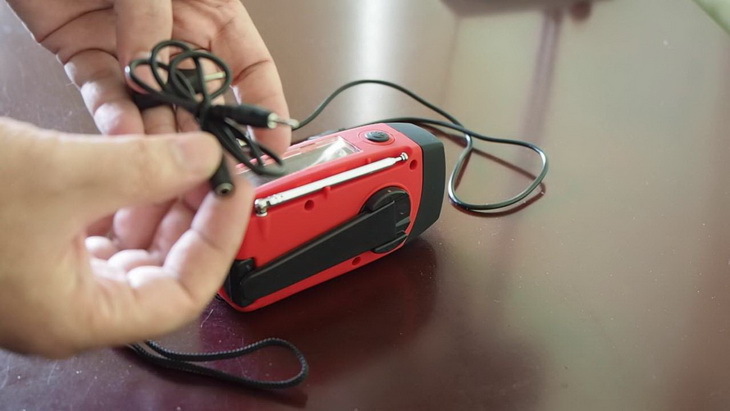 You could also use it for listening to your favorite station or your favorite music playlist. 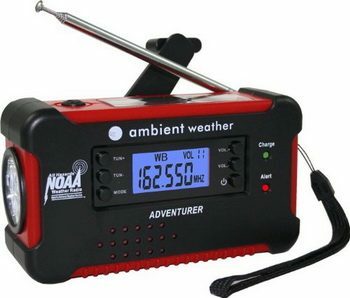 The adventurer radio is a digital alert radio, which makes it a perfect match for many campers or hikers. The product contains three LED flashlights and it comes with a charger for a smart phone. The device could be powered by five different ways. It could be charged from a USB power bank or a computer, hand crank and also by a solar panel. Consider the fact that the solar panel won’t charge the battery to the fullest. The radio has a digital tuner that provides information as well as news and illumination anytime you need it. Its design, of the rubberized finish, makes this adventure radio a comfortable tool for gripping. It is good to know that this device transforms the seventy percent of the kinetic energy into the stored electricity. It could be self-charged while it is in use, so you could never miss the end of your favorite sports match or your pleasant music compilation. Related: The Ambient Weather WR-AC1 Adaptor is the ideal charger for this radio for those days when there simply isn’t enough sunlight, or you don’t have a power bank to recharge radio on the go. Best use: Ideal for walking, hiking, camping, holiday, home, garden and any other outdoor activity. 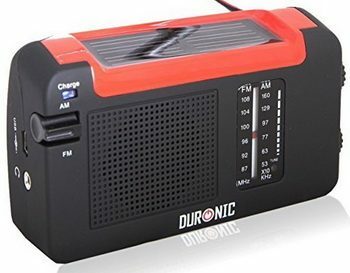 Description: The Duronic Hybrid Radio is a stylish product that is worth to be a part of your outdoor gear. It is a battery free device, and you can take it with you in any weather conditions. This product has a winding arm for creating and storing the needed energy. Also, the solar panel is incorporated at the top of the item, so you could use for playing music simultaneously while charging. On the plastic shell, there is a plug socket for your earphones. You can find the light indicator of charging, which turns blue every time the battery is fully charged by solar or either by windup. The set also includes the USB cable for powering. When it is fully charged the battery will last for a day. Interesting to know is that with just one minute of winding, you will provide twenty minutes of play time. Also, remember that this is a small and lightweight product, which makes it a highly portable item. Related: The Dizaul B00YOP7 Solar Power Bank is an ideal item to buy alongside the radio, this way with enough sunlight, you can charge it and keep it as a reserve charge for the radio. 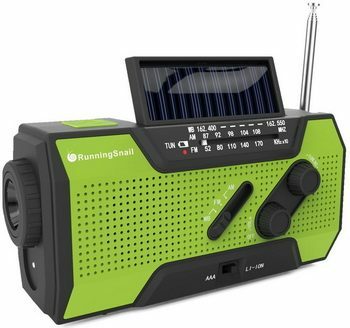 Description: The RunningSnail NOAA Solar Crank is a must have item for emergency situations. It has an emergency weather alert in your region, especially for tornadoes, hurricanes, and other severe storms. It is a good product that could be an irreplaceable tool in your basement. It could save your life by letting you know if a storm is coming. This radio contains LED flashlight and also a table lamp, so you could easily read or just to keep your room bright. The charging options for this device are numerous. It could be easily charged by hand crank, solar panel, and USB Cable. Consider the fact that the item could support twelve hours of lightening after being charged by any charge, or four to six hours of radio playing. The product possesses an SOS alarm with activated red flash, just in case you are in a danger or having an emergency situation and you need help. Related: The Cyalum 9-08001 Glowsticks are a good add-on to the radio, as they are small emergency light sticks that can help you, as well as the radio, in an emergency situation during a camping trip. Description: This iRonsnow IS-088 Radio is a compact and a weather radio system that supports AM/FM so you can easily manage your stations and listen to your favorite songs or reports. The product has a three LED flashlight and it also contains a cell phone charger. The power alternatives of this device are also numerous. It could be powered by solar or external power source or simply by self-charging. 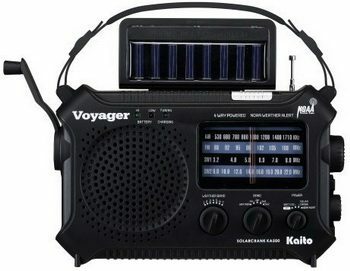 The hand crank that is included in the radio could wind up the internal alternator and also the solar panel could be exposed to the sunlight to generate energy. One thing you should keep in mind is that one minute of hand-cranking supports about five minutes of radio playing time. The light has the power to work about thirty minutes and five minutes of talking on the cell phone. Remember that this device is a good survival and lightweight tool, especially because this company is focused on producing emergency equipment. Related: The SurvivalSpark Magnesium Fire Starter comes with a whistle and a compass, which added to this radio, make a very affordable combination of survival equipment for any camping trip. 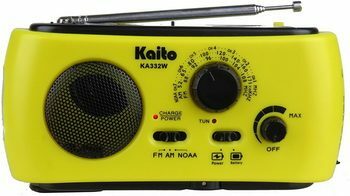 Description: The Kaito KA322W Radio is designed for people who look for an interesting design and good features. This is a five-way charging emergency product that keeps you informed about many things. It comes with a dynamo generator that supplies a power to the device or it charges the internal NiMH power bank. And, it has a solar power system that uses the sunlight to provide energy. Other power sources that can be used are the DC battery and also the rechargeable batteries. Furthermore, the radio has a built in, three LED, flashlight, that is super bright, and the set includes an earphone jack. Another interesting feature about this item is that it supports AM/FM NOAA weather radio stations, and it includes all the seven important weather channels. For all smart phone lovers, we should also mention that the Kaito offers, namely, a USB port which could be used for powering the cell phones or some other USB rechargeable portable devices. Instructions don’t come in English. Related: The LifeStraw LSPHF017 Water Filter is a good add-on for this radio, if you’re planning a camping trip, both will make it easier and better. 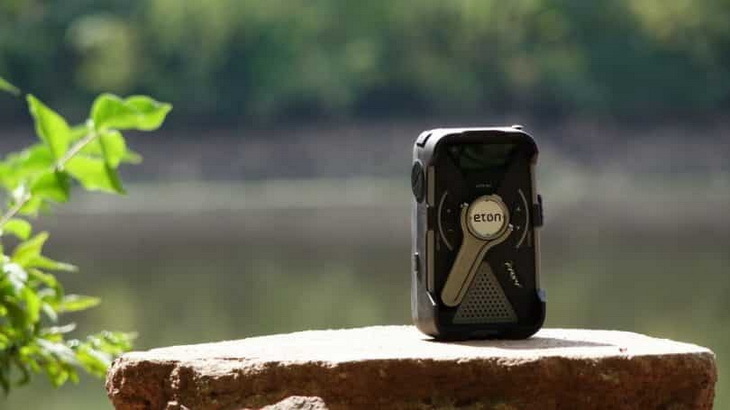 Description: The Eton Scorpion Digital Radio rugged, portable multi-purpose digital radio is good for charging your smart phones. It has an LED flashlight for lighting your path. It also possesses a weather alert that informs you if a storm is coming. This remarkable product could work without batteries which make it attractive to the audience. The radio could be charged in many different ways. You could power it with the incorporated solar panel that charges the battery located on it. And, It is also possible to charge the device and your phone with the crank option. The DC adapter is another great alternative when it comes to powering the item. The fabrication has a special design with vibrant colors, intended for extreme outdoor activities. Also, the digital tuner on the radio is another feature that satisfies the taste of the customers, and, you can easily plug your mp3 player or other devices, to listen to your favorite singer or a group. 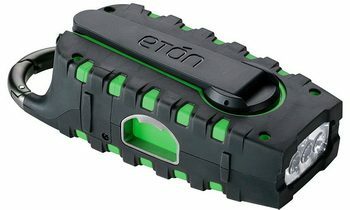 Related: This radio is commonly bought with the T-Power NSP100GR Adapter made specifically for Eton products, this way you can easily charge the radio. 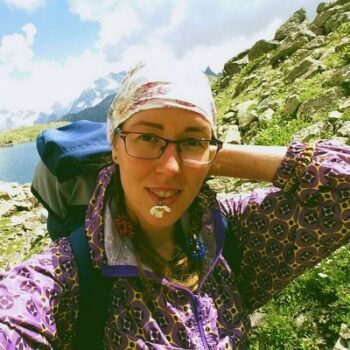 Now that you know which are the features that need to be considered before buying a solar radio for your adventures in the great outdoors, and you also know which are some of the best models on the market, the final choice is no one else’s but yours. Think about what you have learned here, and try to balance out the features and the price, so that you can have a win win situation, a great model for not such a high price. Also, think about where you are planning to go, and what you expect there, so that your new model can meet all the demands that might appear on your trip. All of the models from our list are great, but they are not great for everybody, so you need to make sure the one you choose is perfect for what you need it for. We hope that this guidance would help you in taking the last decision. If you have tried any of these radio systems, please share your experience in the comments section below, so that you can help other readers in making the right choice.